The discussion behind closed doors might have gone like this: We have taken samples from the flanges of the cracked beams over Fremont street, have taken core samples on the other span over first street, have shored up the spans to avoid any further damage, and are waiting for the lab results to determine the “root cause” of the failure. Let’s keep our fingers crossed that nothing else happens in this four-block long transit center topped by a park. The center has been closed since early October when the cracks were first discovered. The current plan, according to a recent presentation to the Transbay Joint Powers Authority board of directors, depends on the outcome of the testing currently being done in New York at LPI chosen by the Peer Group to do a broad range of tests to determine whether it was defective manufacture, bad design or bad execution of the welds that caused the failure in two beams. 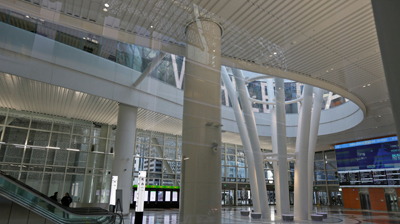 According to Kim Slowey in a post for Construction Dive, the Transbay Joint Powers Authority Board at its Nov. 8th meeting has asked for a wider investigation of the structural integrity of the $2.2 billion facility originally designed to operate as the Transbay transit center with busses and trains interfacing in the multilevel multimodal center. The discovery of the original cracks in two girders spanning Fremont Street caused the facility to be shut down until the safety of the enormous facility could be guaranteed. The team immediately moved to shore up the failing girders on the Fremont span and did the same on the parallel First Street span that has a similar design, even though no problems have been noted there. Once the samples, both cut out of the girder by a method that would not elevate the temperature of the sample and bored out of the First Street girder are analyzed and the “root cause” determined and reviewed by the PEER group, the design team will propose a solution, time frame, budget and present the findings to the TJPA before beginning the repair. The PEER group has gathered in New York at the LPI facilities to review the findings, but no findings have thus far been released to the public. Meanwhile, even though both Fremont and First Streets are open to traffic, the facility has been shut down until the repairs have been made. Based on the ENR article, those repairs would not begin until December at the earliest. We noted in the presentation on Nov. 8th that none of the 72 trade group contracts have been closed out, several of the contingent on setting the ultimate responsibility for the failures. We suspect that the finger pointing, and lawsuits will begin before the repairs are complete. The ultimate usability of the facility will depend on the Board and the PEER group being able to convince the operator of the facility and the traveling public that the repairs have been made and that the facility is safe. Stay tuned as the saga in San Francisco continues.